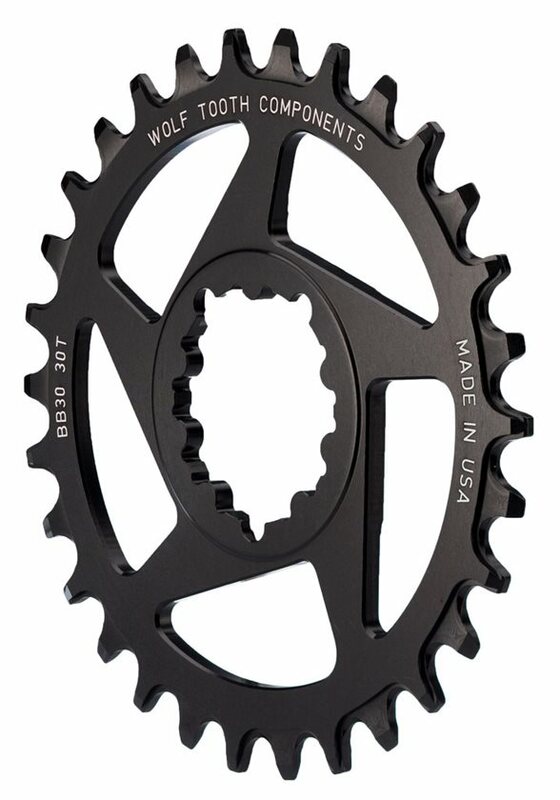 These are Direct Mount chainrings for SRAM BB30/PF30 short spindle cranks will bring a touch of class to your 1x game. This will replace you existing chainring and spider, which is attached via 3 bolts on the back side of the spider near the spindle. You will use these same 3 bolts to attach the SDM ring. 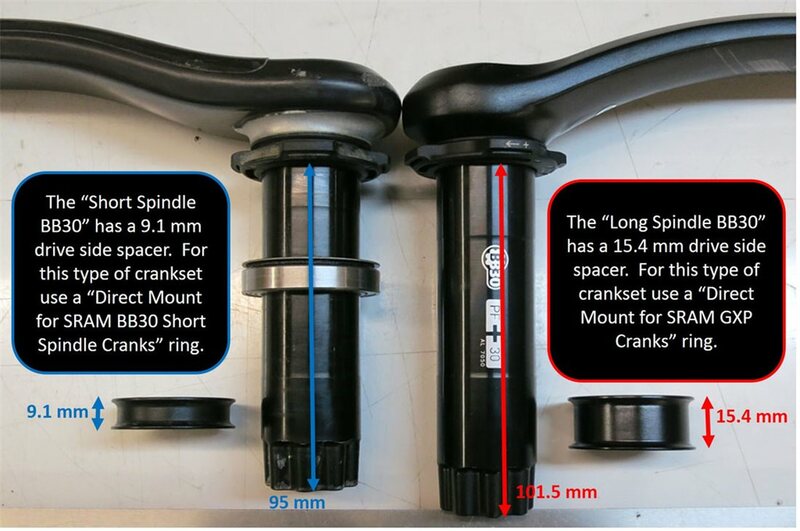 See product photo comparing spindle length to determine if you need this ring or the SDM for GXP/Long Spindle ring. This BB30 short spindle ring is flat whereas the SDM is dished in 6mm. BB30 Direct Mount chainrings fit on short spindle BB30 SRAM S2200, S2210, X9, X0, X01, and XX1. Newer S1400 (or X7) cranksets with removable spiders will work with these rings rings too. Older versions of these cranksets do not have removable spiders. If the crankarm and the spider are all made from the same piece of aluminum it is not removable. Chainline is 50mm on a BB30 / PF30 short spindle crankset. About 55mm on GXP or BB30 / PF30 long spindle crankset. 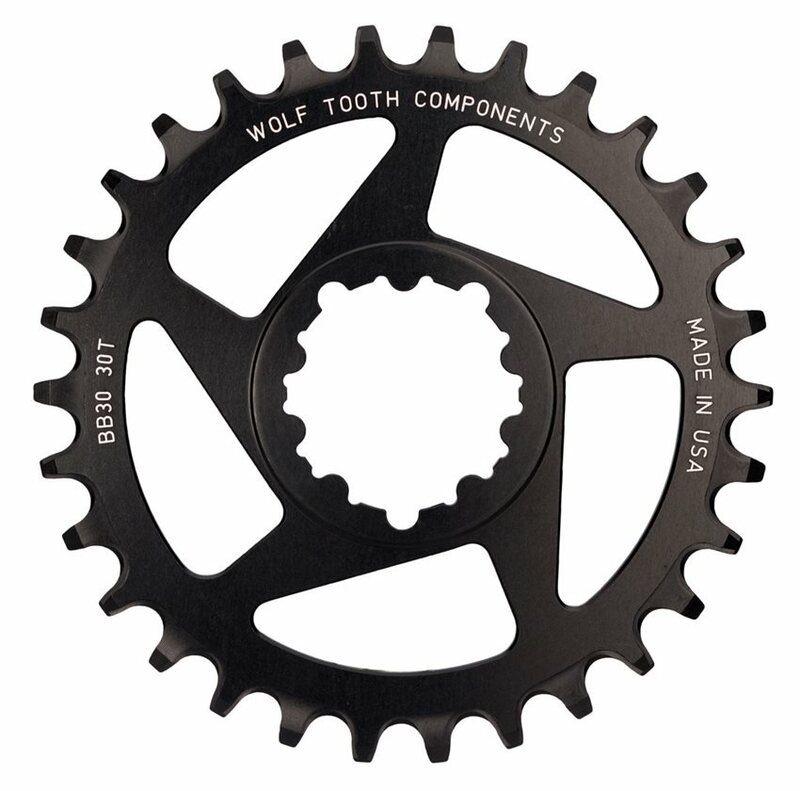 All chainrings feature Wolf Tooth's signature Drop-Stop tooth design and are made in the USA from 7075 Aluminum. ** Note that these also work great on fat bikes with 190 mm rear hubs when using the X9 or XX1 GXP fat crankset -- they provide a great chainline and offer plenty of clearance for the largest tires! It was easy to install on my SRAM cranks. Just removed the 3 screws holding the 2 chain rings and spider and install the new ring. It was that easy. The chainline is about 50mm. So far no chain drops and I've ridden so pretty big jumps. I love it! Jenson is super quick on shipping and delivery. 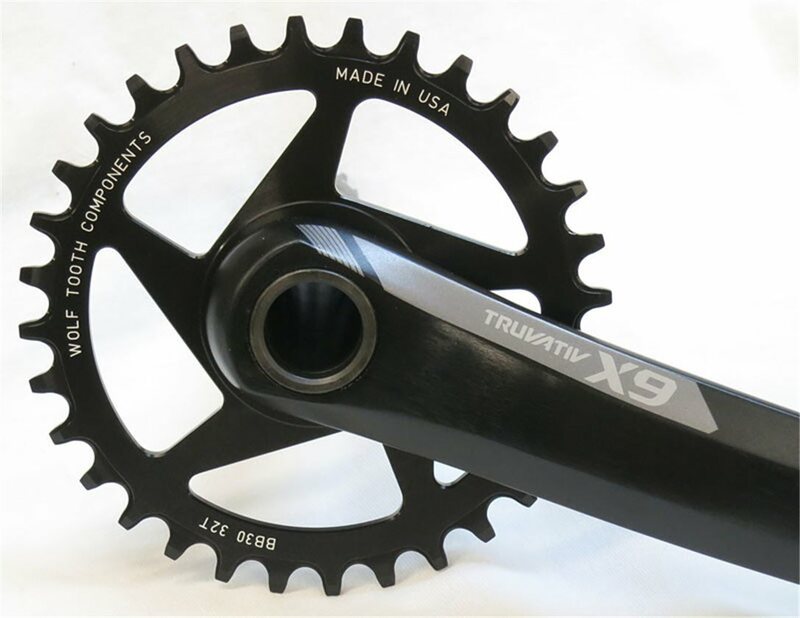 WTC rings have the most options and compatibility when it comes to 1x9/10/11 drive trains. Most BCD options, teeth count and compatibility. Paired this with a x9 crank and going spider less created a good looking system that works as advertised. best performance with a 10speed chain though. 9 speed chains will still work but may drop in the roughest conditions. 62 grams for the 30T. Fits the BB30/S2200 on the Epic Evo 29r and saves a few grams. The Narrow-Wide design is not as pronounced as the RaceFace so I doubt that it would be as effective. I kept the chain guide on my Epic and with my Shadow Plus, don't expect to lose the chain.